"Look at you. All covered in...feathers?!" Being an orphan on the street is hard. Being an orphan on the street and covered with feathers is even harder. 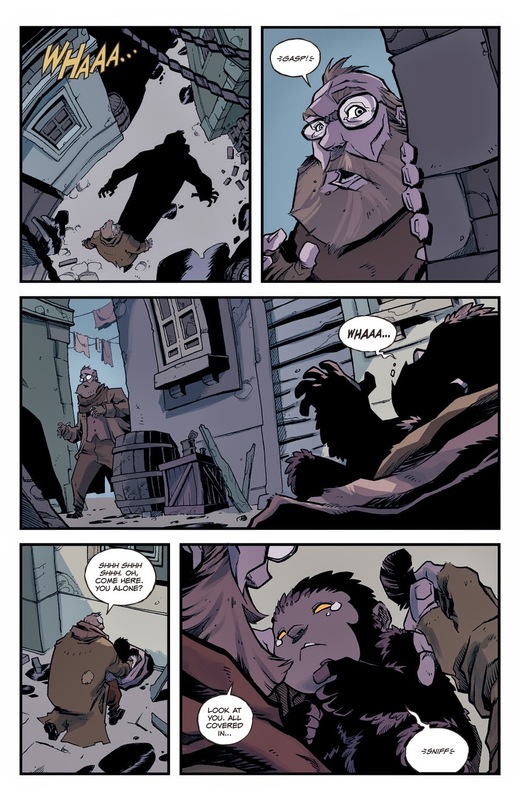 Both scenarios make for interesting reads and Archaia has just that in Feathers #1. The issue is written and illustrated by Jorge Corona. A recluse boy born covered in feathers must help his first-ever friend, a young girl named Bianca, as she tries to return to her home beyond the slums of the Maze. They must dodge street gangs and child-snatchers along the way and perhaps together will learn the secrets to his mysterious past. Meanwhile, the boy's adopted father struggles to ensure his safety and knows all about the risks that come with the two of them pairing up. 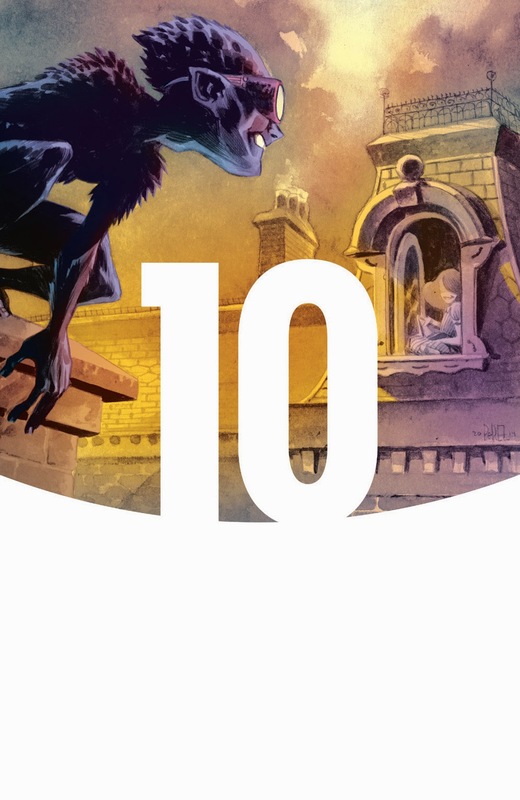 It's pretty obvious that Feathers #1 is inspired by works such as Aladdin. The core concept is a lowly outcast encountering a highborn princess and the two of them will no doubt have to contend with large odds. 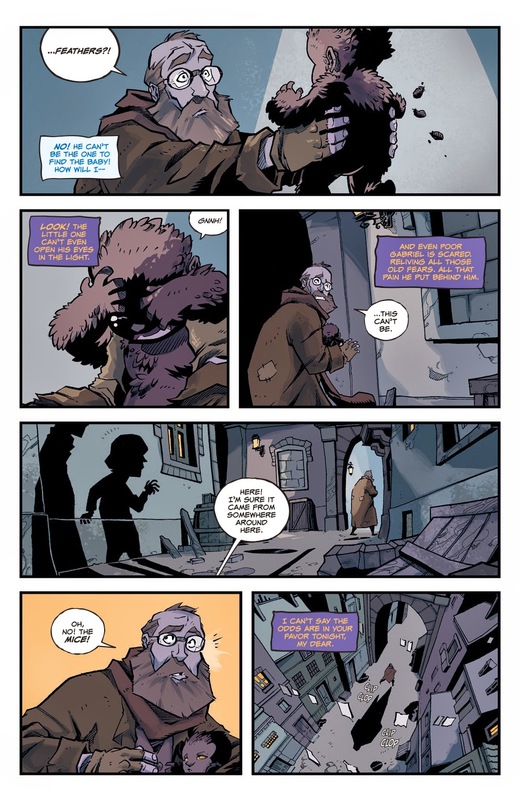 After reading the issue, you'll realize that Feathers #1 is pretty enjoyable and has a very good heart. Corona presents Feathers as a mischievous little boy who just so happens to have feathers, while Bianca embodies the innocence and naivety that accompanies being a sheltered princess. Their dynamic together doesn't really have much time to shine in the first issue, but Corona ensures that their individual personalities are on display. There are some mysteries behind Feather's origin and it's not clear if Corona plans on delving too deeply into them down the road. The illustrations in Feathers #1 are gorgeous, as Corona relies on a style that's equal parts charming and fearful when necessary. The setting of the city is depicted as somewhat grungy and riddled with poverty, while the scenes in the palace offer the requisite elegance. These different presentations further the characterization of Feathers and Bianca, helping the reader better understand the differences between the two of them. 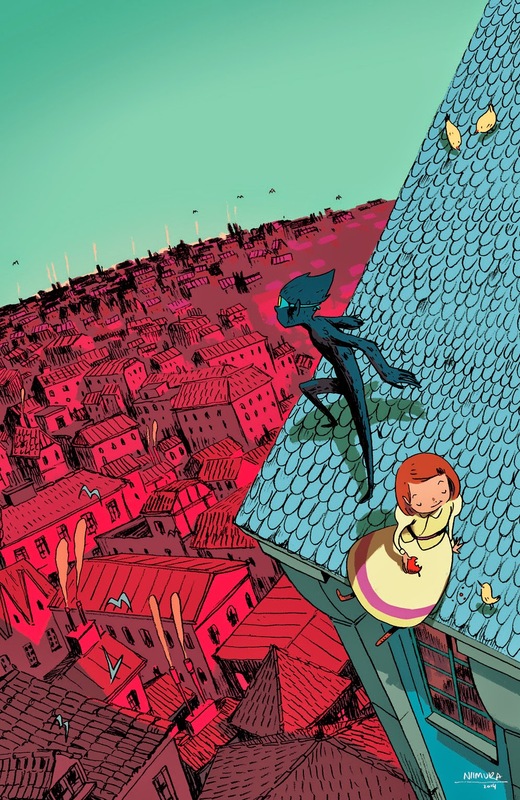 Characters are illustrated with sharp, clean angles that accentuate the liveliness of the city they inhabit. Even Feathers himself looks more human than monster, which helps ground the book in reality more so than expected. 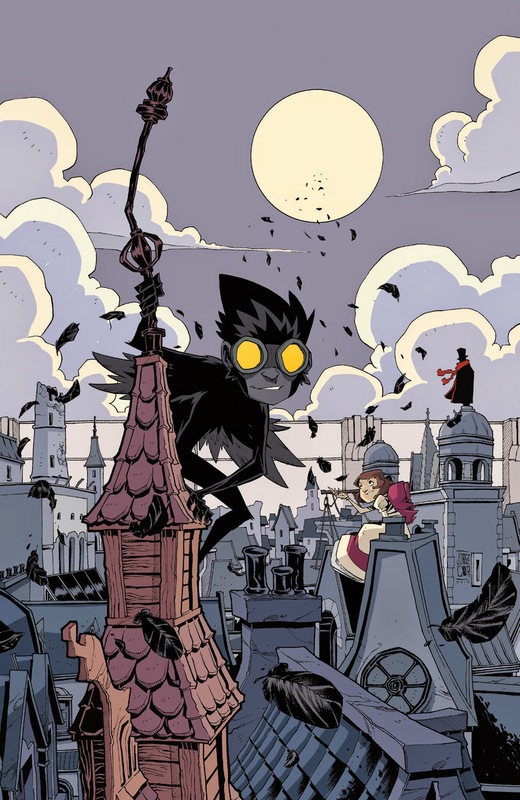 Feathers #1 is a story that's ambitious and seems to be offering a wide range of emotions that range from fear to hope. 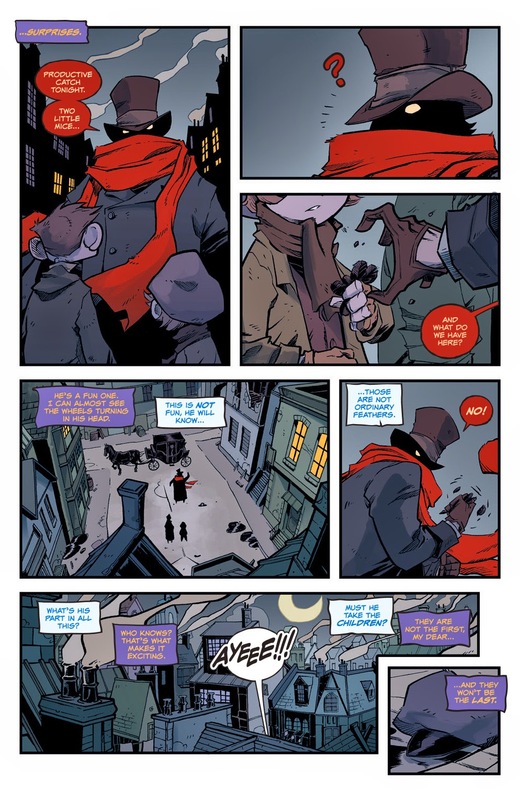 The origin of the main character is shrouded in mystery and it remains to be seen whether or not that origin is given more light; it's possible that the first issue jumpstarts the series and the origin isn't really the point. Corona's story is rather adventurous and hits a lot of familiar notes. His illustrations border on shadowy, but they're extremely effective in building an atmosphere for Feathers and Bianca to exist in. 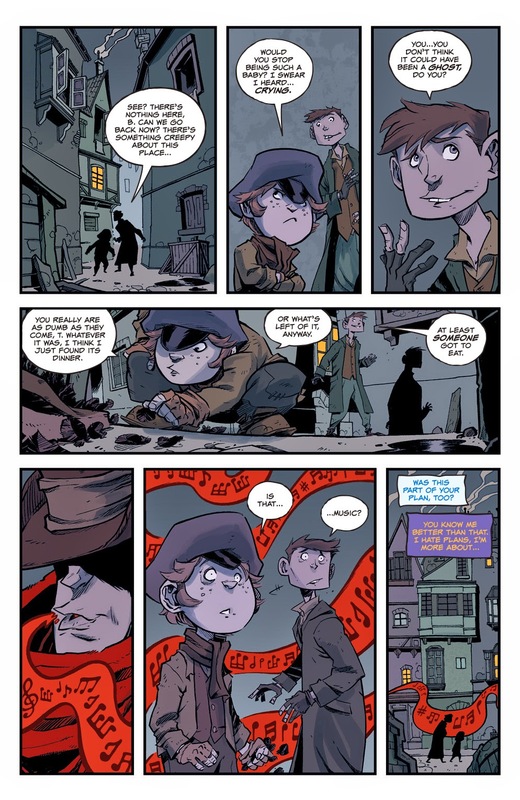 Feathers #1 is a great first issue that presents an all-ages book that could get a lot darker as things progress. 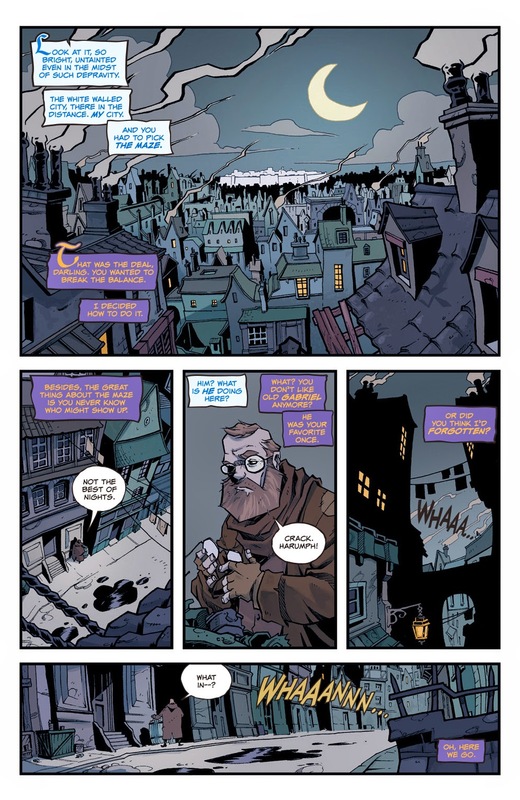 Feathers #1 is in stores January 7 with interiors below.